Paris – An innovative and reliable method has recently been developed by a team from the Laboratoire de Chimie Bactérienne of the Institut de Microbiologie de la Méditerranée (CNRS/Aix-Marseille Université) and the Laboratoire de Glycochimie Moléculaire et Macromoléculaire of the Institut de Chimie Moléculaire et des Matériaux d’Orsay (CNRS/Université Paris-Sud). This work is published in Angewandte Chemie on 9 February 2012. A patent covering this method has also been filed. 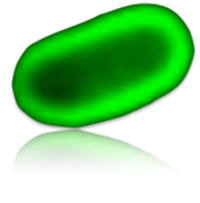 An Escherichia coli bacterium labeled by the incorporation of a modified KDO and coupling with a fluorescent molecule. Click-Mediated Labeling of Bacterial Membranes through Metabolic Modification of the Lipopolysaccharide Inner Core, A. Dumont, A. Malleron, M. Awwad, S. Dukan*, B. Vauzeilles*, Angew. Chem. Int. Ed., in press.